Vimeo.com is a tremendous service for hosting videos, especially because they provide powerful privacy settings that let you control exactly where you want to permit videos to be embedded. First, embed the video on a page of your website using the embed code provided by Vimeo. If this video should be restricted to subscribers, set the restriction options as necessary. 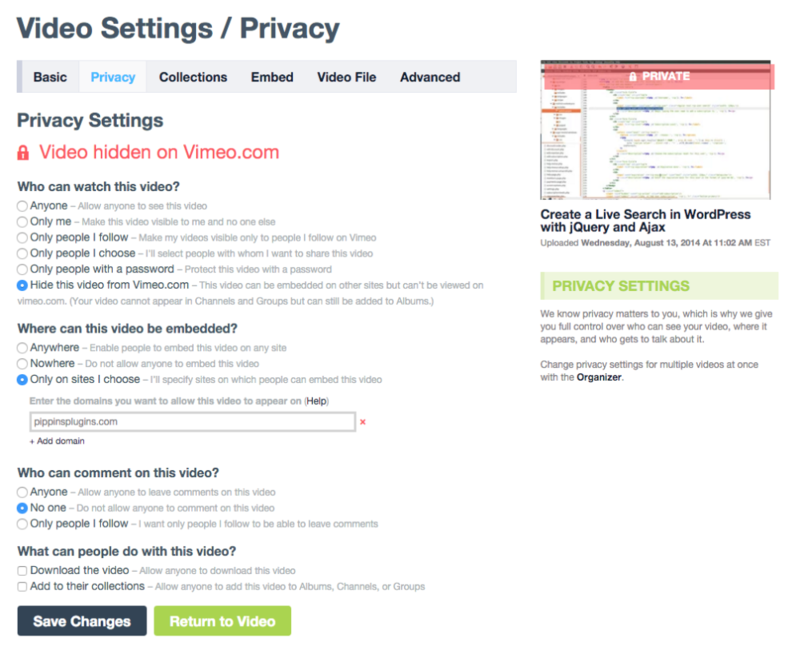 Second, go to the Settings page for your video on Vimeo and click on the Privacy tab. Here you can set the domains that are permitted to embed the video. Set the video to be hidden from Vimeo.com; enter the domain name that you are embedding the video on (the domain you have installed Restrict Content Pro on); optionally set who can leave comments and what viewers can do with the video.